The country is waking up to the benefits of buying real estate in Idaho, and for good reason. When you buy a house in Idaho it is relatively inexpensive compared to many areas of the country. The state boasts a vibrant outdoor experience, the cost of living is low, and employment is up. People are purchasing homes in Idaho for various reasons. Here are five of them. According to 2017 statistics from a major moving company, people are buying Real Estate in Idaho and moving to the state like never before. In fact, the numbers show that more that sixty percent of all Idaho moves the company facilitated were from out-of-state. That is a big number. Relocation is happening for various reasons, but one of the biggest is the cost of living along the west coast and crowded metro areas in the Southwest. The cost of living and purchasing a home in Idaho is hard to beat, especially if you are getting ready to retire. The numbers don't lie. The average retiree from California can downsize and relocate to Idaho and see a considerable change in their financial future. Home prices are lower, property taxes are sometimes as much as 50% less for the same square footage, vehicle registration is dramatically lower, and the overall cost of living is less. It makes sense to take a west coast pension, downsize a home, lower expenses, and live comfortably in Idaho during retirement. Idaho has room to grow, land is relatively inexpensive, and labor in the state is reasonable. These three factors create affordable housing, and this is something families can appreciate when they need to up-size their home. For example, a family living in Seattle in a 4,100 square foot home with 4 beds and 4 baths on half an acre can expect to pay between $1,500,000 to $2,500,000 for a place to hang their hat. The same family can live in Rexburg in a 4000 square foot home on one acre for as little as $350,000. You can buy a lot of season passes to Jackson Hole and Disneyland and book yourself on annual cruises to the Caribbean for the difference. Idaho real estate makes Up-sizing painless when prices are this low. Idaho still has a lot of virgin ground with land to build on. It is still possible to purchase waterfront property and build your own home or cabin without breaking the bank. Land is also available just outside of most cities in East Idaho. Ammon Idaho is a great example. Once an outlying area of Idaho Falls, Ammon has grown to rival Idaho Falls with many shops, restaurants, and services. Home builders have invested in the area and develop neighborhoods of every kind from budget to luxury homes. Rexburg is another area that is growing quickly. As the city expands, agricultural land is being converted to residential land for builders. Much of this growth is being created by Brigham Young University Idaho as more professors come with their families to teach at the university. Fortunately, undeveloped land remains reasonable in cost as expansion continues. 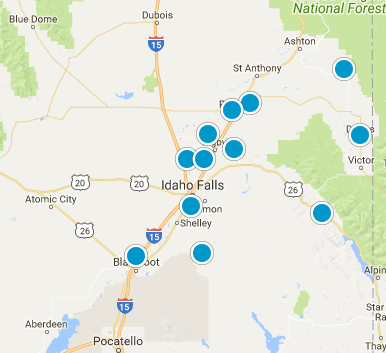 Finally, buying real estate in Idaho has become more interesting as the for sale by owner market has grown, largely due to Zillow and other online property listing service, giving do-it-yourself home sellers a place to show homes. Buyers often initially find homes of this type online, but eventually hire a real estate agent to manage the transaction due to the number of issues that often arise. Some of these issues include incorrect pricing of homes, lack of legal understanding, inexperience pre-qualifying buyers, and working with title companies to make sure that everything necessary for a FSBO is complete and ready to fund. Nevertheless, buying Idaho Property from a for sale by owner seller with some experience can save money in the long run when done properly.